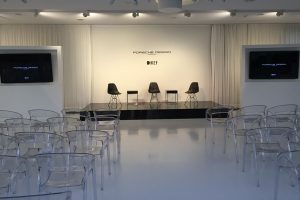 At Ketterer Kunst in Munich, Premium-lifestyle brand Porsche Design and KEF, an originator of British high-fidelity sound, presented the result of an extraordinary collaboration: 3 Hi-Fi audio systems showcasing the refined style of Porsche Design and the peerless sound of KEF. 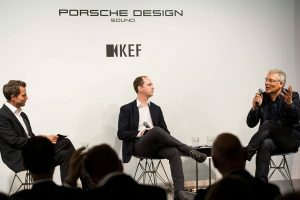 I was honoured to host the presentation, introducing Roland Heiler, CDO of Porsche Design and George Perkins, Senior KEF Acoustic Engineer, who talked on stage about the Porsche Design relationship with KEF, how it came about and how was it working with KEF acoustics engineers to create the products. After the presentation, the audience was invited to experience the products, while enjoying drinks, food and the music from one of Europe’s best DJ’s and long term KEF fan, Moguai.